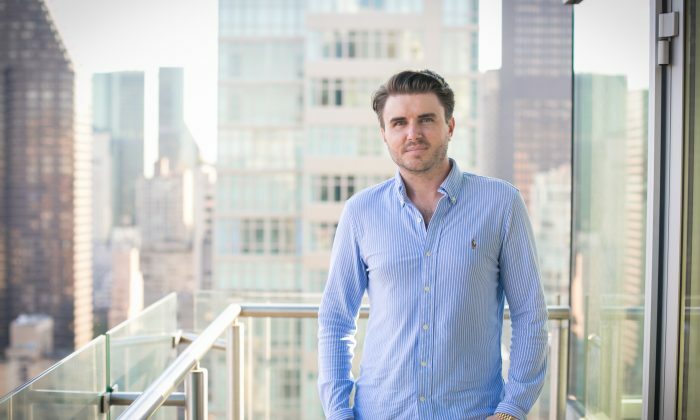 NEW YORK—Entrepreneur Sam Ovens figured out early on that becoming a millionaire was not a pipe dream. At the age of 21, he dropped out of college, broke and depressed. By the time he was 25, he was a millionaire. Ovens, who is originally from New Zealand, achieved something truly unique. He became a consultant to consultants and made over $10 million. From his luxury apartment in Manhattan, he now runs a global e-learning business. Americans are much more encouraging and hungry for life improvement. “I took everything I knew about starting a consulting business and turned it into an online course. I started selling the course. The course grew bigger than my main consulting business,” he said. He was living and working in New Zealand. But he realized that 98 percent of the buyers of the course were Americans. So he decided to move to the United States with his girlfriend and his cat a year ago. “Americans are much more encouraging and hungry for life improvement,” he said. Ovens was once invited to a beach house on a private island owned by an entrepreneur. “I looked around and thought there was no way I could ever buy an island with my job at Vodafone,” he said. And that is when he decided to become an entrepreneur. Ovens started out by launching a recruitment website in New Zealand. It was for job seekers to post their profiles instead of employers posting jobs. He started his business while he was still in school and working as an intern at Vodafone. “I started getting frustrated, trying to balance everything. I stayed in that pain for four or five months. Then I decided to quit my job and my college and went full time with my business,” he said. The business was a complete failure. He lost everything. “The big lesson is that you have to sell something that the market actually wants,” he said. Later, he launched successful businesses, including the property inspection software called SnapInspect and the consulting services. After three years, Ovens came to the crossroads of having to choose between consulting and the software business. Realizing his consulting business was growing faster than the software business, he sold his shares in SnapInspect to his partner and went full time into consulting. He realized that most small-business owners were baby boomers and knew nothing about digital marketing, an area he became good at through his software business. “Helping clients get customers is absolutely the most important thing,” he said. He was making more than $2 million a year from consultancy. People were surprised to see him growing his business fast. He started giving courses to consultants on Skype, teaching them how to build and grow successful consulting businesses. After seeing that his students were also getting good results, he decided to turn the business into an online course. “I was thinking no one else could succeed. But it is amazing to see that they can if you lay out the process properly. And it is kind of annoying, too, because it took me so long to figure out the process,” he said. Today, 10,000 people have enrolled in his courses. More than 100 people join the online courses every day. And he earns $100,000 a day just by selling these automated webinars. His customers include corporate employees who want to quit their jobs, as well as lawyers, doctors, accountants, and students. His training has helped nine people become millionaires. Thousands of people have quit their jobs to start their own consulting businesses. Ovens describes himself as an introvert. Initially, it was very hard for him to talk to people and pitch his business. It took him a long time to make a breakthrough. “For me, the pain of failure was more painful than the pain of talking to people,” he said. Another great challenge he had to overcome was a negative self-image. Ovens was inspired by the book “Psycho-Cybernetics” written by Maxwell Maltz in 1960, which explains how one’s self-image is created, and how one can change it. Ovens is happy to be living and working in New York. “New York makes me think bigger. I am poor in New York compared to other people. No matter how hard I work and how much money I make, I feel poor here. That motivates me. That is why I chose this city,” he said. Disclaimer: Sam’s free training is over 60 minutes in length. At the end of his presentation, he will offer a paid online training program. Should you decide to buy it, a percentage of proceeds will benefit Epoch Times.